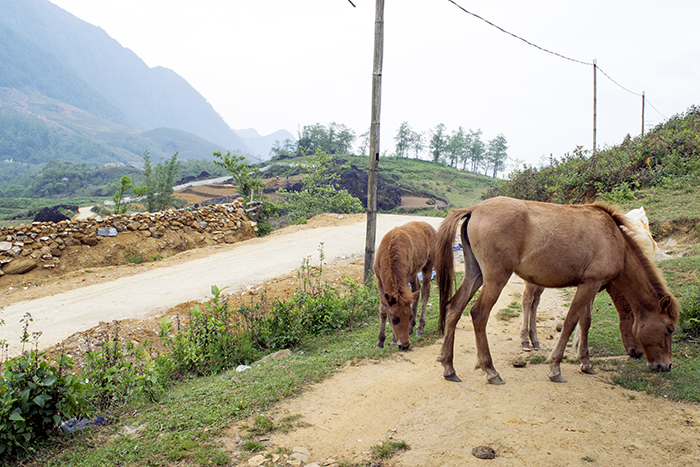 Yesterday, I hiked four hours up from the quiet mountain town of SaPa to one of the nearby H’mong villages. It was incredibly gorgeous. 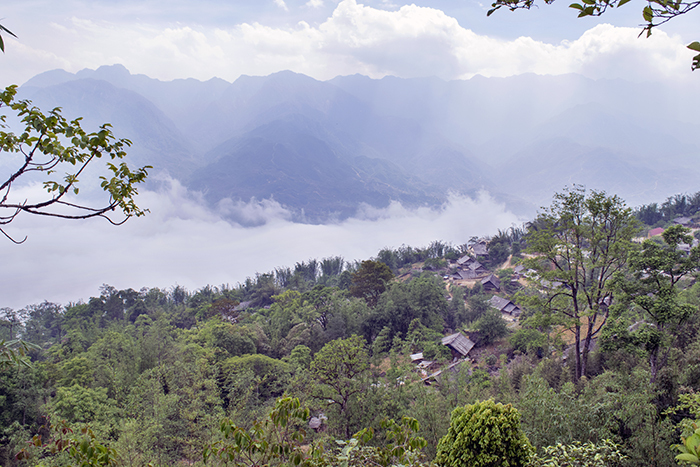 I was lucky; most of the time, SaPa and the surrounding area is blanketed in a fog. But that day the sky was cloudless and it was warm enough outside to merit just a tank top and cropped yoga pants. I didn’t have any hiking shoes with me, just my Converses, which slipped constantly on the loose rocks that made up the steep pathway. We followed the dirt trail through forests, farmland, rice paddies, and up cliffs. 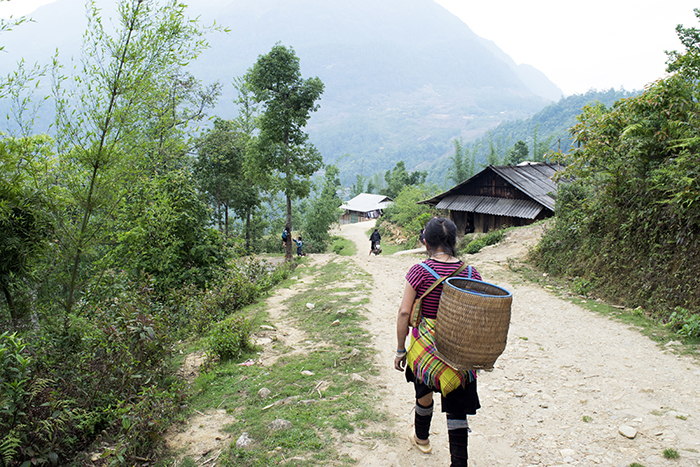 A teeny, feisty villager named Mama Xung (pronounced: Sung) led the way, her rubber slippers never failing as she quickly and deftly clambered over hillsides while I struggled behind. That little lady is quite a legend. She’s forty-something, but she looks about twenty years older, mostly because she’s so tiny and sun-wrinkled, like a raisin. As we trekked, I asked her about her life. Her English is excellent; she took classes offered by a nonprofit in SaPa so that she could enter the tourism industry and her constant contact with foreigners has kept her slang up-to-date. She never went to school and she married her husband when she was in her teens. She’s now a loving grandmother whose youngest grandchild prefers her company to his parents’. One of her best friends is Mama Chi, her next door neighbor that she splits all her earnings with. Mama Xung knew pretty much everybody we passed, chatting with them in their dialect and then explaining that “this guy was a cousin of her daughter’s husband” or “that woman was her husband’s brother’s niece.” Everyone we greeted smiled at me with a welcoming warmness I appreciated. Mama Xung’s cell phone constantly rang. During the trek, she stopped for quick breaks to answer calls and I was pretty impressed by the service we had in this wilderness, hundreds of feet above the nearest cell towers. I don’t think I’ve ever felt so much in another world as I did during that initial hike; I’d never imagined so many shades of green before as were in the gardens of the H’mong. Farms were separated by low, hand-stacked, rock walls secured only by gravity and careful placement. Huts made from mud, tin, and wood sat in wide fields while people worked the land with basic hand tools. Mama Xung took the opportunity to pick up groceries along the way: she purchased fresh herbs, carrots, eggs, dried corn, and chicken from her neighbors. She then carefully stacked each new product in her basket-backpack. When we passed through villages, everyone waved. Toddlers ran around pantless, playing with puppies, picking flowers, and generally shitting wherever they wanted. Wild horses grazed in yards, men balanced twelve-foot tree trunks on their shoulders, and Mama Xung even showed off the local marijuana fields, calling the pale, green sprouts “happy smoke.” She said they use the hemp for weaving baskets and other goods, but many people also use it recreationally. The only uncomfortable moment I had was when a group of young, barefoot girls wearing dirty, ripped clothes, began to follow us, holding out a stack of cheap, colorful threaded bracelets. They flanked me on both sides, all singing a haunting tune. None of the girls smiled, just repeated their memorized melody with glazed eyes until we’d reached the end of the village. I asked Mama Xung if they went to school and she told me that some did, but there were no classes that day because of the upcoming holidays. As we continued, I heard Mama Xung whispering that same chant under her breath. Even though she was staring at the ground, watching her footing, her eyes seemed focused far off on some distant memory. I wondered if that had once been her song, as well. 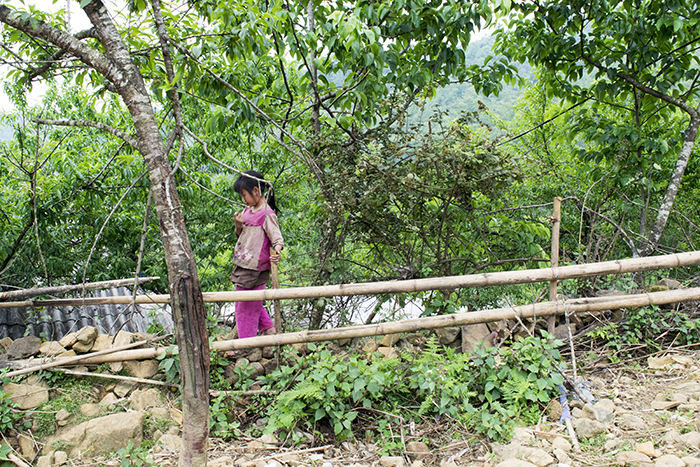 When we reached the village, my shirt was soaked through with sweat and Mama Xung was panting, her jacket now tied around her waist. She led me over a concrete bridge, past a couple muddy, wooden pig shelters, and under the wooden awning of Mama Chi’s home. “Mama Chi be back soon. You stay with her, here. Papa Chu is here. You stay with him.” She swung open the light, woven door that led into Mama Chi’s house. It was dark inside, even though it was only 2PM. I stepped inside the cool room, adjusting my eyes to the dim light. At one end a group of men squatted in a circle around a low table that resembled a metal tray. They all balanced on stools barely six inches above the ground and when they saw me, they motioned me over. In the middle of the table was a plate of half-eaten fish, rice, and several pairs of chopsticks. A short, squat tea cup sat in front of each man. One man stood up, swaying a little. “Papa Chuuuuu!” He said, pointing at himself, his voice rising. The top of his head came up to my shoulder and he wore a traditional, embroidered, button-up blue sweater and dusty brown linen pants. His cheeks were ruddy and his eyes were bloodshot. Another man leapt up and gave me his stool to sit on. As I took it, I was handed a cup and Papa Chu took out a plastic pitcher, splashing on the table and myself as he poured me a shot. I already knew what the clearish liquid was; I could recognize the smell by now. It had the same mustiness as the moonshine of Cat Ba. This was happy water. I sipped the shot because, you know, I’m not rude. Everyone cheered and they filled up the cups again. I tried to introduce myself, but my name was too difficult to pronounce and we settled on calling me “Cat.” But that was as far as conversation could go; from what I could tell, Papa Chu was the only other person who spoke any English and he was so drunk that all he could do was hold his head in his lap and, in a sing-song moan, repeat “Papa Chuuuuu” over and over. A little informative sidenote. 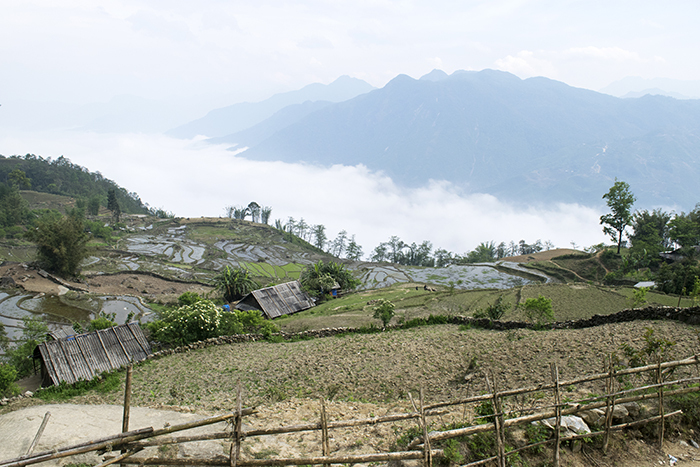 The H’mong are one of several ethnic groups that inhabit the area and have farmed the land for centuries. They only recently (in the past twenty years or so) introduced tourism to their economy and its still a relatively new business. There are large travel companies that you can book with that prepare homestays in some of these villages, but they’re usually group situations and you’re given a bit of a regulated experience: the beds, toilets, food, and alcohol is all approved by Vietnam’s governing tourism authorities. That can definitely be a good thing, but it also often comes with higher prices and a more mainstream experience. I’m also not sure how much of the profits of these tours actually go to the villagers. I guess I have to say I’m a little more adventurous and a lot more thrifty than most and I try my best to stay away from regulated activities. 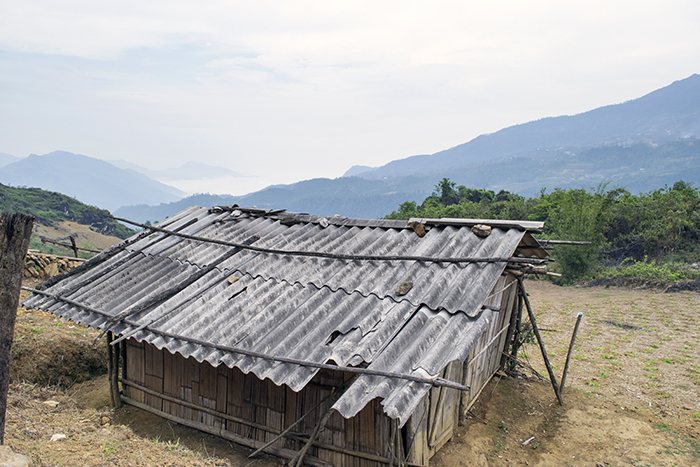 And where I ended up, sharing a bedroom with Mama Chi’s three children in the second room of her dirt floor hut, is not for the faint of heart. So anyway, when Mama Chi arrived, she greeted me with a hug and waved me away when I tried to help her prepare dinner. So I continued watching the men at the table play drinking games as Mama Chi and her daughter took turns leaning over a fire pit, boiling garden greens in a pot of water. At one point, the happy water pitcher was pronounced empty. Papa Chu, in an unsteady dance, climbed up a ladder to a storage area under the roof. He came back down with a gasoline container and refilled it, then refilled all of our cups. Mama Chi served dinner on a wooden table in the middle of the room. There was a large tupperware of rice, a bowl of instant noodles mixed with tomatoes and shredded chicken, and another of the boiled greens, which looked a lot like spinach and which she’d spiced with something peppery that she’d sprinkled from a ziploc bag. After all the adults had finished eating, Mama Chi’s kids ate the leftovers straight out of the serving dishes. Then Mama Chi began drinking, too, and egging me on to join her. The night faded into a woozy daze. It was my introduction to daily life in the village: trekking, binge drinking, and instant noodles. Hiking boots are essential if you don’t want blisters. If you’re not willing to lug around a heavy pair, purchase a comfortable set of sneakers with a lot of grip. I was lucky I didn’t fall down the mountain when I was climbing in my Converses! If you want to do a trek and a homestay, leave your big backpack at a local hostel and only bring a few days’ supplies of belongings. Hostels are accustomed to this and it’s worth the risk to not lug 20 pounds of stuff up a mountain side. Always be wary with local moonshines. It’s probably stronger than you think.